1. brine, inject, or dry rub your turkey. Whatever way you want to salt (and sugar) the meat. Use whatever herbs you want. 2. Don't over cook the meat. That means mid 150Fs for the breast. The thigh should reach at least 175F-180F. Low heat or high oven temp - do whichever you want. 4. Cut the turkey legs and wings off BEFORE it goes in the oven. If you talk to anyone about how to make a juicy turkey, they will all agree on #1-3. Most people will cook until 175F when the plastic popup timer goes off in the turkey. By then the thighs are done but the breast is now dry and horrible. Others will pull it out around 160F and serve bloody thighs, embarrassment, and excuses. Why is it so hard to do this right? If we aren't bringing out a whole turkey, why not cut it up before cooking it? That way you take out the main part (the breast) when it's 155F-160F and it's just barely cooked, white with a slight pink shade. Then you put the legs and wings back in the oven until it's 180F. 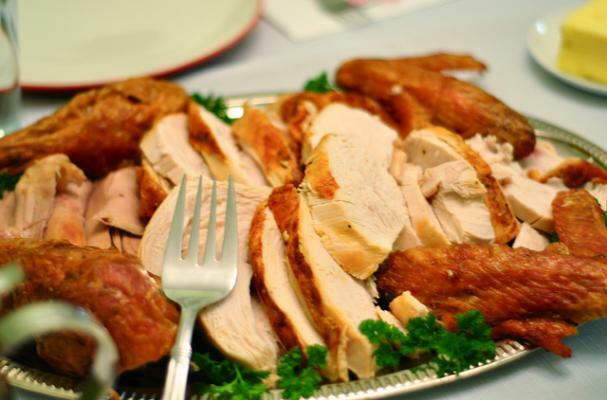 Take your cooked pieces and reassemble the turkey nicely and serve. You have the entire turkey fully cooked but not overcooked while remaining juicy. It's just 1 extra step but makes a big difference.